Hausla Poshan Yojana is a scheme launched by the Uttar Pradesh Government of India. The aim of this scheme is to provide nutritious food to the pregnant women and malnourished children. The scheme was implemented by the Chief Minister of Uttar Pradesh. Pregnant women and malnourished children will get cooked foot and a fruit each under Hausla Poshan Yojana. A village in Shravasti district has been adopted by the Uttar Pradesh Government for the implementation of this scheme. The village has been adopted under State Nutrition Mission. Anganwadi workers will cook food under this scheme. Anganwadi Centers will provide cooked food and a fruit each to the pregnant women and malnourished children under this scheme. More than 48, 000 Pregnant Women have enrolled under this scheme. Under this scheme, the schools will provide cooking space for the Anganwadi workers to cook food. More than 7,840 Gram Sabhas has been adopted under this scheme. Hausla Poshan Yojana is a noble scheme for the citizens of Uttar Pradesh in India. The main objective of this scheme is to take care of the pregnant women and malnourished children. To achieve the objective of the scheme, the scheme is providing food facilities to the target group. Anganwadi workers are also giving useful advices and consultation to the pregnant women. Also, the parents of the malnourished children’s are given useful tips. A facility of regular weight check is also available for the malnourished children. The noble scheme launched by Uttar Pradesh hasn’t fared quite well as expected. The scheme was implemented on a trial basis firstly. But the review of the pilot project was not good enough and thus the government only released 40 percent of the total budget under this scheme. Several workers have reported that only 40-45% of the enrolled pregnant women are availing the facilities of this scheme. Most of the pregnant women aren’t bothered about the scheme. But the number of malnourished children availing the facilities of the scheme is quite appreciative. Another problem is that most of the schools aren’t allowing the space to cook food. Only 25% of the total schools have allowed their kitchen to be used. The main reason behind the lack of attendance is that the food is always cooked at noon while the pregnant women have to take their meal by morning and thus the pregnant women are uninterested to avail the facilities of this scheme. Also, at the time of pregnancy, the women are usually interested to sit with their family and eat food. But this scheme forces a woman to eat alone. So, most of the women thinks that they should be given things which can be cooked or taken home. But the scheme has already received a lot of appreciation and also it is expected that the current condition of the scheme will be improved and the percentage will increase. The scheme has already acted as a ray of hope for the poor people and it is expected to carry out its services. This scheme is expected to succeed after the initial problem. Though Yogi Adityanath desires to launch new schemes for the betterment of the people of Uttar Pradesh, he is ready to re-launch an older scheme. 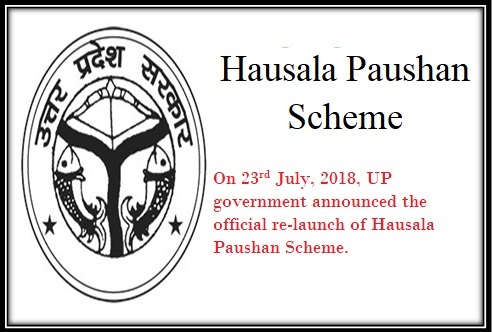 On July, 2018, UP government announced the official re-launch of Hausala Paushan Scheme. The project targets the health and well-being of pregnant women and young children. Ready to eat nutritious food will be offered to 10 lakh women who are expecting a baby soon. Apart from this, the same high-quality food will be offered to impoverished children who fall in the age bracket of 6 months and 6 years. Anganwadi centers will prepare and distribute food among beneficiaries. The list of foods will include 500gm ghee and seasonal fruits.